The community of Pijal has organized a community tourism centre called Sumak Pacha which offers its visitors a wide variety of activities including: Organic agricultural growing, music, dance, national foods, hiking trails, horseback riding, bike trips and rural lodging. Moreover, all the mentioned activities are guided by native guides in the area helping to support the local community. The area of Pijal includes places rich in culture, countryside and spirituality such as: waterfalls, springs, hillsides, bird watching and untouched forests. Family living: One of the main activities in which visitors can partake consists of day to day living with indigenous families. A typical day may include hands-on agricultural work, cooking and pastoring of animals using traditional methods and tools. Handcrafts: The women of Pijal are renowned for their embroidery skills. Other artisans include work with totora (large water reeds), traditional wear and carpentry from prime materials. 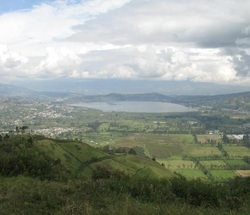 From the Otavalo Bus Terminal take the "Los Lagos" transport via San Pablo del Lago until the Pijal Bajo entrance, from where the community is centre is a short 10 minute walk. From the northern terminal of Quito take the "Flota Imbabura" or any bus that goes via Otavalo. Ask the driver to let you off in Gonzalez Suarez. From there take any bus via San Pablo (approx. 5-7 minutes). Ask the driver to let you off at the Pijal Bajo entrance, from where the community is centre is a short 10 minute walk. Stories and traditions from Pijal is a collection of narrations from the community of Pijal, Ecuador. This is the first published document in Media Lengua, a rare mixed language spoken in the Ecuadorian highlands. This updated bilingual (Spanish-English) pamphlet provides visitors with peek into Sumak Pacha's organization and traditions from Pijal. This visitor's guide compiled in 2009, provides visitors with a brief history of Pijal, indigenous issues in Ecuador, culture & agriculture in Pijal, la Riconada, community tourism in Pijal, and the flora & fauna found in the region. If this link is broken please report it here.